Whenever I see bumper stickers that say “Latinos for Obama,” I always feel a bit conflicted. It is important for Obama and other candidates to acknowledge and address the interests of Latino voters, however in their attempts to appeal to the “Latino vote,” candidates often assume a common, pan-ethnic opinion that implies all Latinos have the same political stance. Such appeals to Latino voters tend to gloss over the internal complexities and tensions that exist within this population, especially with regard to differing opinions on social issues, education, and immigration policy. According to Louis DeSipio in his book, Counting on the Latino Vote: Latinos as a New Electorate, we tend to “homogenize Latino national-origin groups into a uniform whole that [neglects] to account for potential heterogeneity within the Latino population” (29). A number of factors including national origin, citizenship status, and socioeconomic status play an important role in determining Latino opinion beyond the Latino pan-ethnic identity. Candidates use pieces of the various political opinions, which can appeal to certain sectors of the Latino population. However, these appeals become problematic when candidates assume that all Latinos fall under a single category of opinion. Political candidates would be more successful in gaining the “Latino vote” if they interrogate the internal complexities and address the diverse perspectives inherent in the Latino population. On October 30, 2012, I had the opportunity to see Dr. Mark Sawyer, a professor in the Political Science Department at UCLA, speak at Occidental College. Dr. Sawyer spoke about race and its role in this year’s upcoming presidential election. With heightened discussion around immigration policy and a growing Latino population, both candidates are releasing ads that attempt to directly target the Latino population. Dr. Sawyer showed us two ads that both Mitt Romney and Barack Obama released to address what issues they each perceive impact Latino voters. The first ad depicts Craig Romney, Mitt Romney’s son, encouraging people to vote for his father in Spanish (click on this link and watch from 0:20 seconds to 0:50 seconds to see the ad). In this ad, Romney attempts to “prove” himself to Latino voters by emphasizing his family’s connections to Mexico and the Spanish language. The message and images in this commercial seem to say that Romney understands the same conservative family values that he believes Latino voters also uphold. According to DeSito, political strategists “think that moral and family issues, support for a strong defense, and concerns about affirmative action remedies push Latinos and Mexican Americans, in particular, to the Republicans” (79). This assumption causes Republicans like Mitt Romney to appeal to a stereotyped perception of Latino opinion on moral and social issues. The belief that all Latinos have strong connections to conservative social issues generalizes a pan-ethnic opinion of the Latino population. Also, Romney fails to address how particular policies would benefit Latinos and assumes that only social issues concern this population of voters. Barack Obama, on the other hand, released his own ad in an attempt to appeal to Latino voters in California (click this link to view the ad). 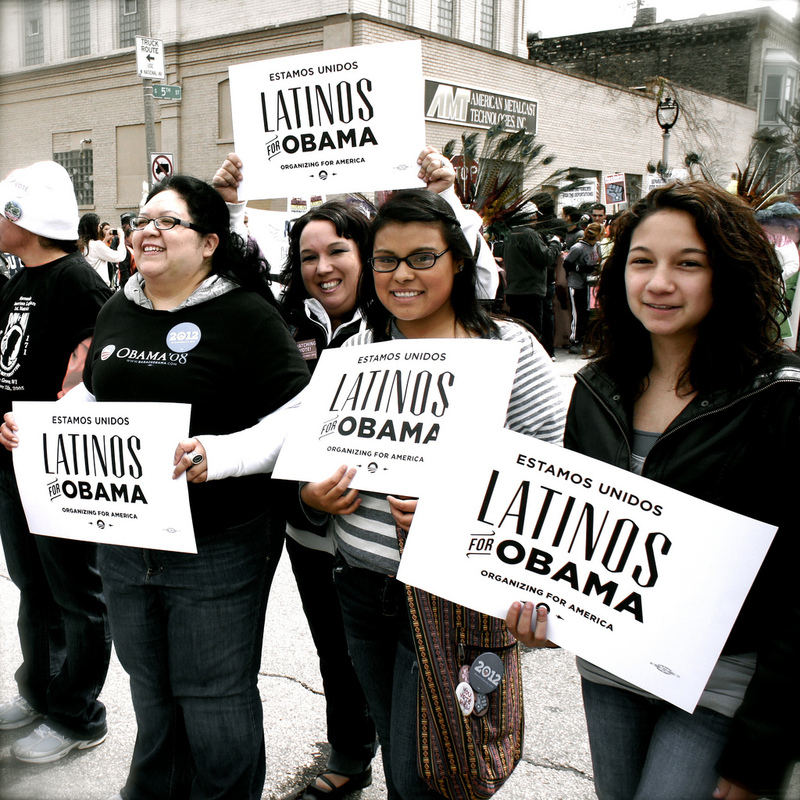 Obama depicts images of Latino activists involved in political initiatives to engage Latino voters. In coming from an activist perspective, Obama highlights the potential of Latino voters to be influential in deciding the election. He also addresses specific policies that he believes will benefit this community alongside many other groups that make up our diverse nation. Although Obama fails to address particular national-origin issues and tends to appeal to pan-ethnic opinion, his ad seems to connect more accurately to the Latino population and shows the ways in which Latinos contribute to our country. Rather than attempting to connect to Latino voters on a personal and moral level, Obama’s message seems to be that Latinos have an important stake in the future of our country and the policies we create regarding healthcare, the economy, and education matter for this sector of the population. Unlike Romney, Obama does not try to “prove” himself to Latino voters, but he does make direct appeals to the Latino population and shows that the voices of young Latino activists matter. I recognize that my analysis of these two campaign ads seems to be biased, however, I believe that Obama’s appeal to Latinos more effectively addresses an inclusive, pan-ethnic Latino opinion than Romney. Obama’s discusses policies that include and have to potential to significantly impact Latino populations, while Romney tends to assume that all Latinos have a conservative stance on moral and social issues. In addition, Romney’s attempt to identify with Latinos by describing his background fails in comparison to the way in which Obama identifies with Latino activism and political movements. Obama’s appeals are not perfect as he often glosses over the complexities and internal tensions that may exist within the Latino population, but I think he connects better with Latinos by really thinking about their political interests. In aiming to appeal to Latino voters, candidates must respectfully consider the diversity of this population and give voice to Latino leaders and members of society in order to truly implement change. Very interesting comparison between the two. However, how can reconcile the fact that Obama’s immigration policy has resulted in more deportations of (Latino) immigrants than any other previous president? It is very fascinating that Obama has managed to disentangle his position toward Latinos from his position toward immigration. Yes, Obama does seem to show two very different perspectives in his attempts to appeal to both Latinos and potential swing voters or voters that may want to see harsher immigration policies. Obama has proudly stated that his presidency has resulted in more deportations than any other presidency before, but he stands strongly by Latinos who are productive members of society and in this particular ad, he neglects to even mention immigration policy. He seems to keep the two issues very separate as he attempts to appeal to simultaneously appeal to two opposing opinions regarding immigration policy. Despite the fact that his policies have led to heightened deportations, I think Obama still stands strongly with the majority of productive, hardworking Latinos through his initiatives that benefit the working class, such as healthcare reform and the economic recovery act, and policies that benefit Latino youth and their families, such as the DREAM Act. These policies demonstrate direct action in supporting Latinos and his ad highlights the need to create space for Latinos to express their voice. Unlike Romney who assumes that the only two Latino interests are immigration reform and social issues, Obama provides a much more widespread perspective of a number of issues and policies that benefit and affect Latino voters. Yes Obama’s policies have resulted in mass deportations, but they have also benefited many productive Latino members of society who deserve to be included in policies that seek to better the rest of our country.